"I spent Christmas evening with the other doctors and the sick. The Commanding Officer had presented the letter with his last bottle of champagne. We raised our mugs and drank to those we love, but before we had had a chance to taste the wine we had to throw ourselves flat on the ground as a stick of bombs fell outside. I seized my doctor's bag and ran to the scene of the explosions, where there were dead and wounded. My shelter with its lovely Christmas decorations became a dressing station. One of the dying men had been hit in the head and there was nothing more I could do for him. He had been with us at our celebration, and had only that moment left to go on duty, but before he went he had said: "I'll finish the carol first, O du fröhliche!" A few moments later he was dead. There was plenty of hard and sad work to do in our Christmas shelter. It is late now, but it is Christmas night still. And so much sadness everywhere." The German army was trapped outside Stalingrad during the bitterly cold Christmas of 1942. Among the German troops was Kurt Reuber, a clergyman and doctor. Drawing on the back of map of Russian (the folds can be seen on the reproduction above) he used a stick of charcoal to portray Mary holding the baby Jesus in her arms, and shielding Him with her arms. The words above are taken from Kurt Reuber's last letter before he was captured by the Russians. He perished in a Soviet prisoner-of-war camp. 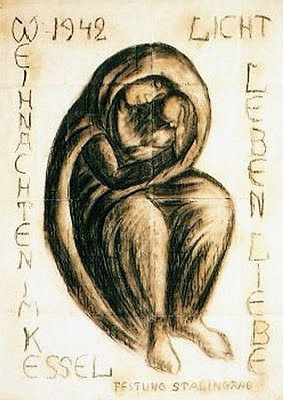 His family chose the Kaiser Wilhelm Memorial Church in Berlin to display the Madonna of Stalingrad, and to pass on the message of light, love, and a sense of protection contained in this moving drawing. A message particularly appropriate at this Christmas time. Two copies of the Madonna have been sent from Berlin as symbols of hope and reconciliation. One is in Coventry Cathedral which was destroyed by German bombs in 1940, and reconsecrated in 1962 with the first performance of Britten's War Requiem. The other is in the Russian Orthodox Church in Volgograd (formerly Stalingrad). Thank you for this very moving historic image and story. Even though Shostakovich's Seventh was composed during the Stalingrad Battle, it refers to the Leningrad (present-day St. Petersburg) siege, which lasted approximately 900 days, from 1941 to 1943. The symphony was partially composed while Shostakovich was in Leningrad from 1941 to 1942. For its first performance, which ocurred while the city was still under siege, the score was smuggled by airplane through the German blockade. The performance was, I believe, in the Philharmonic Hall, and it was broadcast by radio, with explosions echoing in the background. The symphony is called "Leningrad Symphony." Konrad, you are quite correct. On reflection I agree my reference to Shostokovich's Seventh Symphony was confusing in this context. Based on your comment I have now amended the last sentence to refer to the Eighth Symphony which is known as the 'Stalingrad,, although it was composed a little later than the events portrayed above. There is also the point that Shostakovich may not have intended the Eighth to refer to Stalingrad. One school of thought says that the title was convenient post-rationalisation by the composer to offset criticism that the work was unduly pessimistic. Thanks for pointing out the ambiguity. As these articles are a constant point of reference for readers arriving via search engines it is important that between us we make sure they are accurate, and amendments such as this are much appreciated. It is wonderful, and moving, to see the message of the Madonna being reproduced in other languages. Follow this link for a Japanese version.